The financial challenges of the journalism industry have resulted in significant declines in the number of employed reporters, editors, anchors and photographers. Minority journalists, who were already underrepresented in newsrooms, have, for the most part, experienced the same type of decline in recent years. The National Association of Black Journalists, founded in 1975, meets in Boston this week for its annual convention. Here are some facts about the state of black and minority journalists. 1The number of black journalists working at U.S. daily newspapers has dropped 40% since 1997, according to the latest data from the American Society of News Editors. That represents a loss of almost 1,200 journalists — from 2,946 in 1997 to 1,754 in 2013. 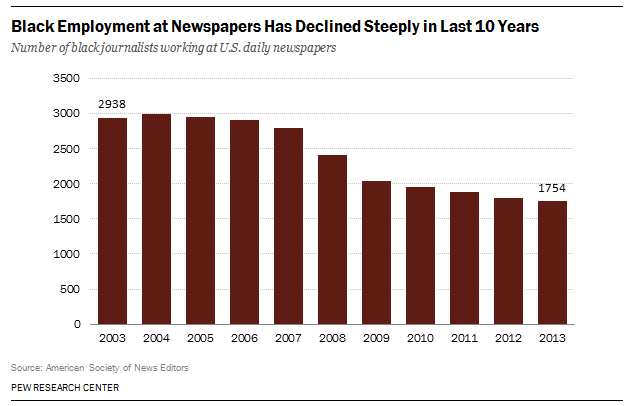 It’s also a steeper decline than the rate of job losses for white journalists — a 34% decrease during the same time period. In the last 16 years, the ranks of Hispanic and Asian journalists have also declined, though not as steeply — losing 13% and 2%, respectively. 2Just 10% of the local TV news workforce was black in 2013, the most recent available data. That’s a decline from 2009, when the rate peaked at 12%, according to RTDNA/Hofstra University’s survey on women and minority employment in local broadcasting. But it’s identical to the percentage RTDNA recorded in its 1994 survey. In local radio, the past 20 years have produced ups and downs. Blacks made up nearly 5% of the workforce in 2013, more than double the percentage in 2012 (2%). The share has jumped around over the past decade; the highest percentage recorded was 6% in 1994, but 10 years later, it had fallen to less than 1%. 3For black journalists in leadership positions, the story is mixed. 2013 was a record year for black TV news directors, whose percentage increased to the highest level recorded by RTDNA: 4%. Although that represents a small fraction of decision makers, it is more than double the percentage in 1994. There was no change in the proportion of black radio news directors from 2012 to 2013, it remained at about 2%. The rate of black newspaper supervisors remained at 5% in 2013, which is equal to the percentage ASNE reported in 1997. 4Overall, minorities accounted for 13% of newspaper newsroom employees in 2013, a modest increase from the 10% recorded 2o years earlier, according to ASNE. There is greater representation in local television journalism, where 22.4% of all staffers were minorities in 2013. That is an increase from 1994 when minorities made up 17% of local TV employees. By comparison, 13% of the local radio workforce is non-white, up from 5% four years earlier, according to RTDNA/Hofstra University data.